Experts propose setting up special anti-corruption body | Russian Legal Information Agency (RAPSI). MOSCOW, March 22 - RAPSI. Experts of a working group for forming an open government have proposed setting up an anti-corruption federal body, which will be authorized to control the activities of top-ranking officials, carry out witness protection and temporary suspension of suspects. "It is necessary to establish an ad hoc anti-corruption federal body. Many countries took this track. Experience has shown that corruption in Russia cannot be fought under the current circumstances without setting up such a body," Sergei Alexashenko, the Higher School of Economics' macroeconomic research director, said during the meeting. He added that the body must enjoy authority and the government's strongest support. Its functions should include analytical work and the protection of witnesses and individuals reporting on corruption. However, a separate law will have to be adopted as well, he said. Additionally, the body must be authorized to suspend legal instruments in action if they are found to facilitate corruption. When speaking about the body's legal form, he said it could be a bureau, "a federal prosecutor, a federal prosecutor's office." 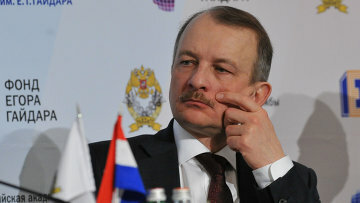 Aleksashenko added that this must be a collegiate body independent of other agencies. A public council must be established by the body, as well, he said. 18:02 22/03/2012 Experts of a working group for forming an open government have proposed setting up an anti-corruption federal body, which will be authorized to control the activities of top-ranking officials, carry out witness protection and temporary suspension of suspects.